Thanks for taking the time to do this interview Ash. 26 years on and off. There are so many musicians who have influenced me along the way, and so many styles I appreciate. The guitarists which really stand out for me and I would say have influenced the way I play my music today are Igor Presnyakov, Tommy Emmanuel, John Williams & Jimi Hendrix. Of course there are others- too many in fact! From a young age music has embedded itself into my memories. It plays such a significant part of my life. Especially in my teenage years- hours and hours were spent rehearsing in friends bedrooms. I remember like yesterday this one time, I must have only been around 11, me and one of my friends made an album on cassette. We managed to sell about 3 at school! He has sadly passed away now but I thank him for some great times and memories. This all led to me studying music at college. I was in a variety of bands of all different styles from Red Hot Chilli Peppers to Nirvana. These memories and experimentation have led me to find myself as a musician and I have them to thank for where I am today. Years ago I tried out classical but it just didn’t excite me at the time. I continued in the rock/punk bands until about 5 years ago I thought I would give it another go. I don’t do anything by halves and after some serious research and checking out other great classical players I was hooked. I knew this was going to be a challenge but with practice I could see it all falling into place and starting to pay off. I began to use the guitar body as percussion, practising hammers and pulls offs which enabled me to play one handed- this free’ed up my right hand to tap on the body. I also play a lot of Spanish style so learning the various hand techniques has opened to many doors for me in regards to creating music. Your music has so much passion and movement to it. How much of music do you think is a learned skill that anyone can attain with practice and discipline versus a talent that some people are just blessed with and unfortunately, others aren't? I personally think a good musician is made up of a mixture of both talent and discipline. No matter how talented someone might be, he will never reach a certain level without practice and discipline. For those lucky enough to be naturally capable, they can only get better and better with practice and skill. That doesn’t mean people who don’t pick it up so easily cannot succeed- I believe with music, what you put in pays off. 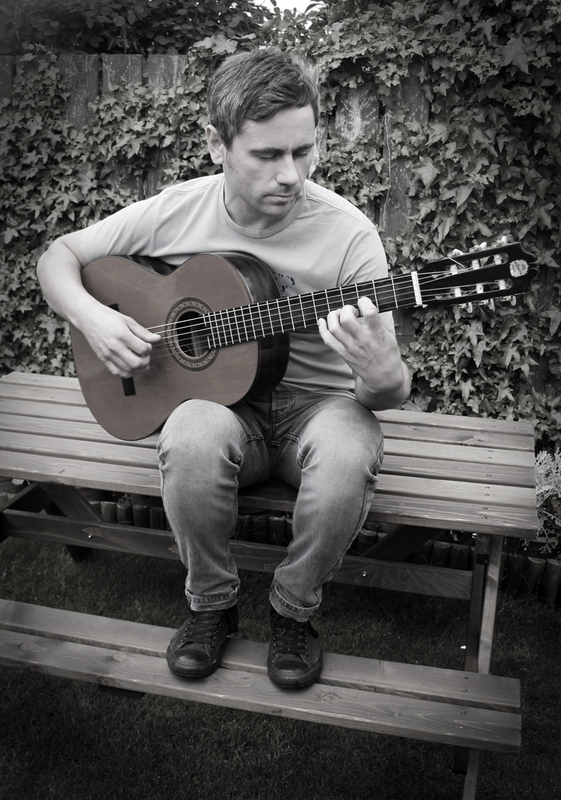 What top tips would you have for beginners on the classical guitar? The most important thing, the number one, is to practice every day. I think even it’s just 10 minutes it’s better than doing one hour just once a week. Because that creates a routine, you create space for it. It’s also because it becomes discouraging sometimes, but if you do a little bit everyday things develop along very well I think. Even if it’s just 10 minutes. And what top tips would you have for those progressing a bit further, or slightly more advanced , on the classical guitar? It’s important to practice the very basic technical really slowly over and over again until your happy with it. When I practice or when I am learning a new song I always start off by breaking everything down and learn every part separately until its mastered. Depending on how hard it is, sometimes I can spend a week, 2 hours a day just learning one part and it can almost drive me insane at times. As long as you keep persevering then the hard word will pay off in the end. So when you’re not practicing or playing what do you like to do in your down time to relax? To be honest I often find myself working on up to 5 different arrangements at the same time so I don’t let my mind rest too often! When I do relax I love spending time with my girlfriend and our daughter. The simple things make me happy- days out, picnic etc. I’ll admit I am a real family man. Admittedly maybe a bit old before my time- I have just got into gardening and growing my own veg. I currently have 42 chili plants in the greenhouse. That hot sauce is going to be fun! Well I’m not going to lie and say it’s easy because it’s not at all. I try to fit practice in around my family- so during my daughter’s nap time or in an evening. My girlfriend that is so understanding, we just make everything work. Some Monday’s and Tuesday’s I work away so I often take my guitar with me so I can practice in my hotel room which is a bonus to be fair because I get to practice 3 hours a night. I had always heard of Admira guitars and every time me and my girlfriend went to a different city I would always have to find a music store and ask if they had Admira guitars, I would spend a good half hour just playing each one while my girl went shopping. To be honest I still do that now, even in my own city I go and annoy them. No stairway to heaven though! I play the Virtuoso- I love the amazingly rich tone it produces. The easy string tension and low action make it a breeze to play. It has a solid cedar top, rosewood back and sides, ebony finger board, ebony reinforcement in the neck- a total bargain for the money and I would recommend anyone getting one. I would love to own a Teresa one day. They are the best Admira guitars. What can we expect from you within the next 12 month? Well for the last 4 years I have been smashing out covers left right and centre and I have actually brought out 2 albums. I have always said when I get to a standard of playing I am happy with then I will start writing my own material to make an album, so thats what I have been doing for the last 2 months or so. I have written 2 songs so far- you can find the videos on my facebook page. After I have written 5 tracks I am wanting to make another album. There is so much going on musically for me at the moment, but it feels like everything is falling into place. It is my passion and I love that the hard work is paying off.